Mexico Accused Of Torturing Suspects In Missing Students Probe : The Two-Way A group of independent experts, charged with examining the case of 43 students who vanished and were allegedly slain in 2014, is also accusing Mexican officials of failing to cooperate with the probe. 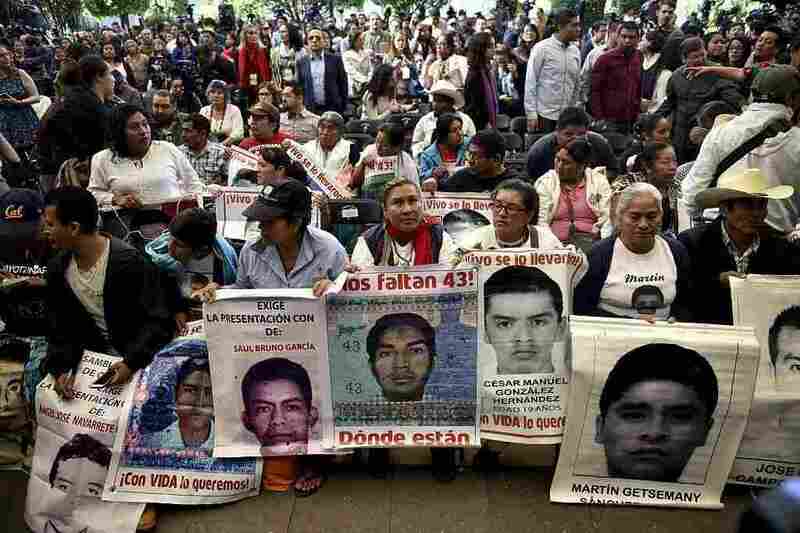 Parents and other relatives of the 43 missing students from the Ayotzinapa's teachers school attend the reading of the final report from the Interdisciplinary Group of Independent Experts (GIEI) in Mexico City on Sunday. An independent group of experts, which was charged with investigating the notorious case of 43 students who disappeared and were allegedly slain in 2014, is now accusing the Mexican government of failing to cooperate with its investigation and torturing suspects. The final report of the Interdisciplinary Group of Independent Experts, released Sunday, says "the government's stonewalling stopped them from reaching the truth as they wrap up their work and prepare to leave Mexico," Reuters reports. According to The New York Times, the investigators say, "They have endured carefully orchestrated attacks in the Mexican news media, a refusal by the government to turn over documents or grant interviews with essential figures, and even a retaliatory criminal investigation into one of the officials who appointed them." Panel member Claudia Paz y Paz tells the Times that "the conditions to conduct our work don't exist." The newspaper adds: "For some, the inevitable conclusion is that the government simply does not want the experts to solve the case." The government maintains that it has "fully cooperated with the experts." NPR's Carrie Kahn says that at the press conference announcing the findings, group member Alejandro Valencia said the government has primarily relied on confessions — "many through torture" – rather than scientific evidence. Seventeen of the approximately 100 suspects "showed signs of beatings, in some cases, dozens of bruises, cuts and scrapes," The Associated Press reports. The report was commissioned by the Inter-American Commission on Human Rights. However, the IACHR has said "it will not renew the experts' term because the government was opposed to an extension," according to Reuters. "Authorities contend the 43 were kidnapped, then murdered by a local drug gang. All the bodies were allegedly burned in one night at a garbage dump. That version has been publicly challenged by relatives and international experts." She reports that today, "the group says it concludes that there was no burning of the 43 students at the garbage dump as the government has claimed." As the presentation concluded, Carrie reports the crowd gave the panel a lengthy standing ovation, shouting, "Don't leave!" She adds that, according to the head of the IACHR, there was no government representative present at the news conference to receive the panel's report. The government did not immediately comment on the findings, Reuters reports. "The arrival of the international experts inspired hope and a shot at closure, if only vicariously, for those who suffer their losses quietly on the margins of Mexican society. In an exceptional gesture, Mexico was granting foreigners permission to conduct a true investigation. Now their departure is a bitter one."